Sen. Lamar Alexander of Tennessee is shown after a weekly Republican caucus luncheon in 2011. Republican Sens. Lamar Alexander of Tennessee and Pat Roberts of Kansas are heavy favorites to win their primaries this week against conservative challengers, but the data from past primary challenges suggest that Alexander has a higher chance of being upset. Little primary polling has been released for Alexander’s Thursday primary. His main opponent, state Rep. Joe Carr, has trailed by anywhere from 7 percentage points (in a Tea Party Nation-sponsored poll) to 29 points (in an Alexander-campaign-sponsored survey). The most recent nonpartisan poll, conducted last week by the Red Racing Horses blog, didn’t call cellphones. Still, it showed Alexander up 41 to 29 percent, with 10 percent split among the other candidates. Even less polling has come out for Roberts’s Tuesday primary. His main opponent, radiologist Milton Wolf, has been down by anywhere from 12 percentage points in a Tea Party Patriots Citizens Fund-sponsored poll to 20 points in a nonpartisan SurveyUSA poll taken two weeks ago. A Google Consumer Survey conducted online Sunday had Roberts ahead 53 to 39 percent. So the polling suggests Roberts is in better shape than Alexander, but primary polling is notoriously shaky. As was seen in Georgia two weeks ago, even states where surveys have been mostly reliable can see major polling errors. “Obama-vote” is the share Obama got in the state in 2012. “Dwn_1” is the liberal-conservative score, and “dwn_2” is the insider-outsider score. The important thing to note in the Stata output is that all the coefficients — see “Coef.” — are positive (the larger they are, the more of an impact they have, but only the two DW-nominate coefficients are on the same scale). The p-values — see “P>|t|” — are less than 0.05. Although statistical significance is an overused term, the p-values indicate statistical significance significant at the 0.05 level. Keep in mind, though, the root-mean-square-error is just under 16 percentage points on an incumbent’s vote share. That means that the margin of error on forecasting is far from perfect. But let’s go through each of these variables for Roberts and Alexander. Republican incumbents tend to face more serious challenges in more conservative states (as measured by Obama’s performance). Obama won only 38 and 39 percent of the vote in Kansas and Tennessee, respectively, in 2012. In other words, Kansas and Tennessee are the type of conservative states where we’ve seen viable GOP primary challenges in the past. Republican incumbents also tend to do worse the more moderate they are, and Alexander is more moderate than Roberts. Per DW-Nominate’s first dimension, Alexander has the seventh most moderate record of any Republican senator in the 113th Congress. Although it’s on the more conservative end of defeated incumbents, Alexander’s score is within the range of other incumbent Republicans who have lost in primaries in the past decade. Roberts, on the other hand, has only the 17th most moderate record. No Republican senator with his type of record has been defeated in a primary in the past decade. Roberts’s score looks a lot like Minority Leader Mitch McConnell’s, who won his primary this year in Kentucky by 25 percentage points. Additionally, Republican incumbents tend to do worse when they’re seen as insiders, and Alexander is rated as more insider-y than Roberts. It was this measure on which Cantor looked most vulnerable. Per DW-Nominate’s second dimension, Alexander is ranked 12th among Republicans in the current Senate. Roberts comes in at 16th. Roberts’s score isn’t too far from Alexander’s, but it leaves Alexander in the more vulnerable position. Finally, Republican incumbents have done better when they’re more firmly against immigration reform. 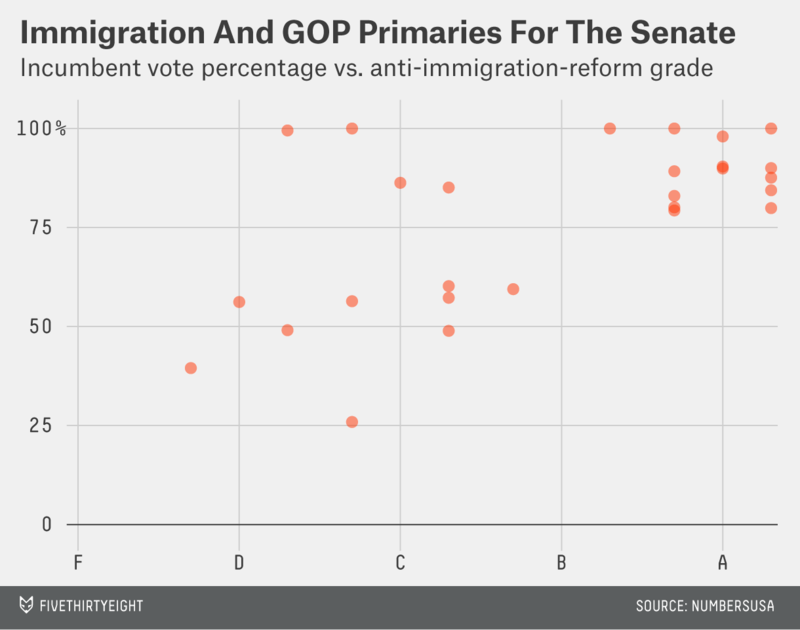 We can see this by comparing primary vote shares and the grades each senator was given by NumbersUSA, a group that advocates for “for lower immigration levels.” Higher grades are indicative of more anti-immigration reform records. Although it’s not clear whether immigration itself matters to GOP primary voters, or it’s symbolic of other issues, or it’s merely a confounding variable, incumbents do better with higher grades. As I noted previously, this relationship holds even when controlling for the partisanship of the state. This is bad news for Alexander because he earned only a C+ from NumbersUSA. That’s the same score as Sen. Thad Cochran, who barely won his primary this year in Mississippi. Roberts, however, was given A+. It’s probably why in Tennessee, Carr has focused a lot on Alexander’s immigration record. In Kansas, meanwhile, Wolf has keyed on, among other issues, Roberts’s residency problems. Indeed, the fact that Roberts doesn’t actually live in Kansas is a good representation of why the margin of error on these estimates is relatively high. The measures used here don’t capture everything. Candidates and campaigns, especially primary campaigns, matter, and it’s not inconceivable that either Alexander or Roberts loses. At this point, though, Alexander’s and Roberts’s records look good enough to carry them over the finish line.